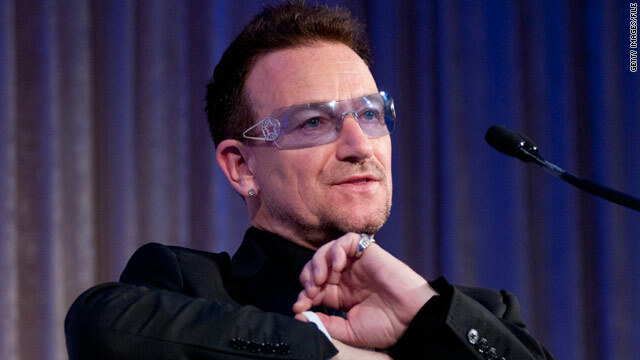 Singer Bono suffered a serious back injury while preparing for for his band's U.S. tour. NEW: Band cancels Glastonbury Festival appearance scheduled for June. (CNN) -- U2 lead singer Bono has been discharged from a German hospital where he was treated for a back injury, concert promoter Live Nation said Tuesday. The band's North American shows have been postponed until next year, Live Nation said. And the group has canceled a planned headline appearance at the Glastonbury Festival in England next month, organizers said on their website. Bono suffered a serious back injury Friday while preparing for the resumption of the band's U.S. tour, the band said, and had emergency surgery. "Bono suffered severe compression of the sciatic nerve," Dr. Muller Wohlfahrt said in a statement provided by the concert promoter. "On review of his MRI scan, I realized there was a serious tear in the ligament and a herniated disc, and that conservative treatment would not suffice. I recommended Bono have emergency spine surgery with Professor (Joerg Christian) Tonn at Munich's LMU University Hospital on Friday." Tonn said Bono was in severe pain and had already suffered partial paralysis in his lower leg when he was referred. "The ligament surrounding the disc had an 8-millimeter tear, and during surgery we discovered fragments of the disc had traveled into the spinal canal," Tonn said in the statement. "This surgery was the only course of treatment for full recovery and to avoid further paralysis." Tonn said Bono is now "much better" and has regained all movement. "The prognosis is excellent, but to obtain a sustainable result, he must now enter a period of rehabilitation," Tonn said. Eight weeks of rehabilitation is considered a minimum, Wohlfahrt said. U2 Manager Paul McGuinness said the band is working with Live Nation to reschedule the tour dates. "Our biggest and I believe best tour has been interrupted and we're all devastated," McGuinness said in the statement. "For a performer who lives to be on stage, this is more than a blow. He feels robbed of the chance to do what he does best and feels like he has badly let down the band and their audience. Which is of course nonsense. "His concerns about more than a million ticket buyers whose plans have been turned upside down we all share, but the most important thing right now is that Bono make a full recovery."